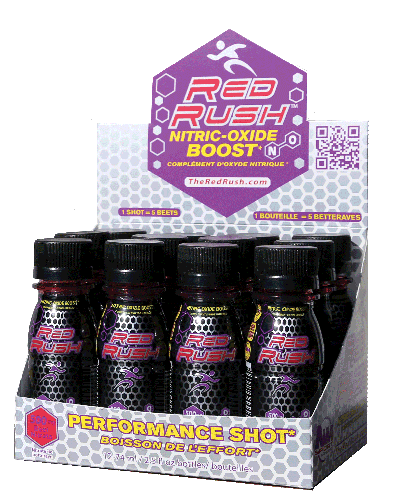 Red Rush™ contains concentrated beet juice that generates a nitric oxide boost, providing improved physical endurance. For performance, stamina, and recovery, the body craves an infusion of nitric oxide through whole-food, natural sources. Red Rush meets this need with a highly concentrated beet juice shot. Nitric oxide significantly impacts blood flow and oxygenation, two keys to improving athletic and physical performance. Included in this pack are 10 foil-wrapped Berkeley Test® nitric oxide strips which monitor the amount of nitric oxide in the blood before and after drinking Red Rush. These strips can be used to test your personal nitric oxide levels or by Business Builders as a marketing tool to promote Red Rush.